this APPSC Forest Beat Officer and Assistant Beat Officer jobs. Exam Syllabus PDF is updated in this notification. Those who are withing the age limit and qualified Inter they can apply online before the closing date of 23-03-2019. 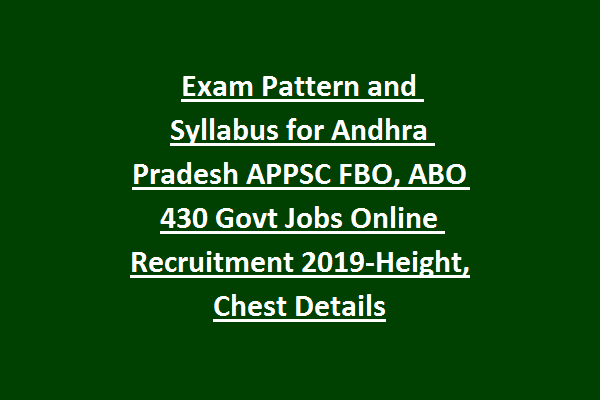 ABO Exam Pattern and Syllabus, FBO Exam Pattern and Syllabus Pdf is updated below for this APPSC Recruitment 2019. Hall Ticket release date also updated in this notification. 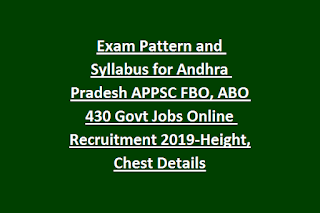 There are total 430 FBO, ABO Posts are in this AP Forest Services recruitment 2019. Upper age limit is 30 years as on 01-07-2019. 5 years of age relaxation is applicable for reserved candidates. Intermediate qualified candidates are eligible to apply online. Written exam will be conducted in two stages for this FBO/ABO jobs followed by walking test. Preliminary exam will be conducted 150 Marks. Total 150 objective type questions will be given. For Male: 25 Kms walking to be completed in 4 hours. For Female: 16 Kms walking to be completed in 4 hours. Online applications are accepted for this APPSC Forest Beat Officer, Asst Beat Officer jobs recruitment till 27-03-2019. Official website to apply online is www.psc.ap.gov.in. Hall ticket release date, exam syllabus pdf, exam result and other info is updated in this website only.